Tonight, after hearing from the owner of Viva Mexico Tacos 2004 as well as several concerned residents, the CB 7 committee was unanimous in its decision to recommend that the liquor license for Tacos 2004 not be renewed. In a meeting that lasted just over an hour, tales of defecation and unseemly behavior overpowered the owner's promises to improve the effect his establishment has on the surrounding area. Even though less than 25 people showed up to listen and speak at tonight's Public Hearing, there was plenty of detail about neighborhood heartache to fill the room. The hearing began with the owner, speaking both for himself and through an interpreter, explaining that he has owned the business for approximately three and a half years. He went on to say that cameras have been installed both inside and outside the restaurant since the February shootings. He also promised to make his personal numbers available, and to post them, should there be trouble. The owner lamented that the shooting was "his bad luck" because the argument that preceded it did not begin in his restaurant. (This was later disputed by a neighborhood commentator.) In fact, he claimed that there is never violence inside his restaurant. This prompted a called out question about why police are often at the establishment. The owner glossed over the comment by pointing out that other restaurants nearby have problems with intoxication and violence as well; his restaurant is not alone. He also claimed that patrons only drink beer, and sometimes wine, while they are eating. Again, this comment encouraged called out questions about the prevalence of hard liquor. The owner denied the presence of hard liquor at first, but then he corrected himself to say "un poquito" - a little. He clarified that many patrons bring small bottles of liquor with them, in their pockets, into the restaurant. In response to a question about operating hours, the owner stated that Tacos 2004 is open from 2 PM until 2:30 AM seven days a week. During a less than friendly question period, the owner was confronted with questions about dancing at Tacos 2004; he denied that any dancing takes place. This brought at least one resident to his feet in response, and it led to a question about how often the owner is actually at his restaurant. He claimed to be there almost every day, and his new manager is there consistently as well. However, the owner could not estimate how often the police come to Tacos 2004, and he claimed that "perhaps one" summons had been given recently. 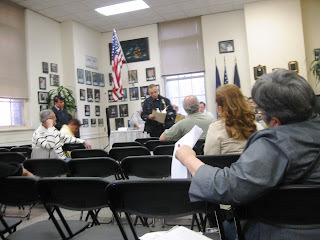 The report from Sergeant McGoey of the 72nd Precinct painted a slightly different summons picture. According to the report, 31 summonses (somehow the number 39 was thrown about as well), ranging from obscured windows to failing to check ID to serving intoxicated patrons to operating without a cabaret license, were issued directly to Tacos 2004 in the last 13 months. Naturally, that does not include any summonses for drunk and disorderly conduct, public drunkenness, fighting, or public urination/defecation issued to patrons outside of the restaurant. The sergeant also reported that the February 22nd shooting is still an open and active investigation. During the commentary section of the hearing, several residents, all personally affected by the goings-on at the restaurant, stood up to speak. Tales of urine, vomit, feces, and blood began to appear. Patrons sleeping in the park after a night of debauchery was the tame side of the tales. Using residential walls as toilets was a common complaint. Stories about destruction of property, and even one incident of a very drunk patron entering a home and insisting he belonged there, were spelled out. Another resident said that her laundromat has to lock its doors during the afternoons and evenings to keep patrons from Tacos 2004 from entering and harassing women and children as they launder household clothing. Another nearby resident said that walking to work in the morning means finding all manner of human waste, and sometimes the humans themselves, in her path. She lamented that children on their way to school have to pass by this often. She also explained that returning from evening classes means crossing the street away from Tacos 2004 to avoid being harassed or made to feel afraid for her safety. She then has to re-cross the street to get home. Several residents reiterated the presence of dancing in the restaurant. (In fact, a Village Voice review and a NYTimes article even mention it.) They also all complained of noise issues between 1 AM and 4 AM; these included obscene arguments and honking car services. Everyone agreed that Sunset Park deserves better. Several people repeated that this is a neighborhood of families, hard-working people, and concerned residents, most of whom have lived here their entire lives. One of the more ominous comments came from a man who organized an extensive petition against the renewal of Tacos 2004's liquor license. He reminded the room that the recent shooting occurred at 9:30 PM. As summer approaches, he said, families will start to stay out later with their children, and why should they be afraid to walk along their own streets for fear of stray bullets hitting their children? Another concerned resident asked about the age of the "very young" and scantily-clad waitresses. The claim that these waitresses dance with patrons for $2-$4 per dance, sometimes sitting on patrons' laps, brought up concerns for the well-being of the young ladies as well. There were veiled references to prostitution, but it never became overt. Agitated, the owner repeated a desire to be heard, and he claimed again and again that his restaurant is not the only one to cause trouble. This is probably true, but it is his liquor license that is up for renewal. And it is his restaurant in which three men were shot, and one killed, not three months ago. Hopefully, the full CB 7 vote and the official state licensing powers-that-be will listen to the unanimous vote of the CB 7 committee. Hopefully, the owner of Tacos 2004 can turn his establishment into a true restaurant, minus the liquor problems and borderline prostitution issues. Tacos 2004 actually has some fans of its FOOD. I suggest lots of Jarritos Tamarindo and horchata. Hire the woman on the corner of 44th and 5th to make her limeade for the restaurant. If the owner was even on the verge of truthful, he makes his money with his food, not with the liquor - and certainly not with the dancing waitresses. Show us that this is so! Serve pernil beyond compare and tacos that beat out Matamoros. Serve tortas at 2 PM and Chilaquiles all day and evening. Sunset Park residents like to eat! That's an awesome last paragraph, you're writing is so great, seriously. Someday I will be as active in my community as you are! Maybe I can start when Sophia starts sleeping, probably.